November 16, 2009 (not a postmark date; materials must be received by our offices before or on November 16). The spring 2010 semester begins with our winter residency, January 1 to January 10. Creative nonfiction writer Amy Hoffman reads from her work-in-progress, Lies About My Family: A Memoir, on Thursday, October 29 at noon, as part of the Wellesley Centers for Women Luncheon Seminar Series, Cheever House, Wellesley College. MFA Director and poet Meg Kearney’s latest book, Home By Now, is available for preordering from Amazon and will be available in stores starting October 15. She will be reading at Food for Thought Books on Saturday, October 17 at 7 p.m., 106 N Pleasant St, Amherst, MA. Fiction writer and Solstice MFA writer-in-residence Dennis Lehane will be appearing (along with Solstice favorites Andre Dubus III, Tom Perrotta and a host of other luminaries) at the Boston Book Festival, scheduled for Saturday, October 24 in Copley Square, Boston. Young people’s writer Grace Lin will be reading from her new book, Where the Mountain Meets the Moon, on Saturday, October 17 at 1:30 p.m. at The Blue Bunny, 577 High Street, Dedham Square, Dedham MA, and on Sunday, October 18 at Belkin Lookout Farm, 89 Pleasant St. South, South Natick, MA. MFA Student Jasen Sousa reads with members of Books of Hope — a writing and performance program for youth ages 13–12 — on Thursday, October 15 at 7 p.m. at the Central Library, 79 Highland Avenue in Somerville. Grace Lin will be reading on Saturday, Oct. 3 at 3:30 p.m. at Toad Stool Bookstore, Lorden Plaza, 586 Nashua St., Milford, NH. Grace Lin will be reading with a group of children’s writers on Saturday, October 10 from 9:30 a.m. - 1 p.m. as part of the Novello Festival of Reading in Charlotte, NC. Meg Kearney will be reading at the Columbia Museum of Art on Friday, October 2 at 6:30 p.m., located on the corner of Hampton & Main Street, Columbia, SC. MFA student Hannah Goodman’s new young adult novel, Fear of Falling, is available at Amazon.com. Multi-genre writer Laban Carrick Hill’s creative nonfiction piece "Rose" is currently online at Planetary Stories Project. Dennis Lehane’s novel The Given Day is now available in paperback. MFA graduate Danielle DeTiberus was recently hired to teach Freshman Composition and Literature at Trident Technical Community College in Charleston, NC. MFA student Angela Foster will be teaching a class, Beginning Memoir: Finding the Story, at The Loft Literary Center in Minneapolis, MN, on Saturday, December 12, 2009. MFA graduate Erika Sanders will be teaching for the Afghan Women's Writing Project — an online project connecting women writers from the US with Afghan women writers — in January/February 2010. Student writings will be posted to the projects blog at http://awwproject.wordpress.com. MFA Consulting Writer Jacqueline Woodson will be keynote speaker for the 10th annual “Books for the Beast’ Young Adult Literature Conference, Saturday, October 24 in Baltimore, MD. Jackie will also be presenting at the Michigan Council of Teachers of English Autumn Assembly 2009: Many Voices, Many Literacies, on Friday, October 30. HCAM’s Poetry in Motion interview with poet Kathleen Aguero is now online at: http://www.hcam.tv/series/poetryinmotion/video.shtml. MFA Assistant Director Tanya Whiton will be creating a performance/installation piece based on the U.S. military actions in Diego Garcia on Saturday, October 3 as part of Sacred & Profane, an annual arts event on Peaks Island, Maine. Grad Insider, an online forum for graduate students, invites currently matriculated students to contribute program reviews. mfaconnect.com is an online magazine covering both writing programs and the craft of writing. A collective forum, mfaconnect.com invites students in MFA programs nationwide to join in by submitting information, posts, and articles. Three Candles Press announces its First Book Award for a volume of poetry, with a deadline of October 15, 2009. Passager is in search of fiction and creative nonfiction by writers over 50 for its upcoming issue, with a deadline of October 15, 2009. The Ledge Magazine announces its poetry chapbook competition, with a deadline of October 31, 2009. A River & Sound Review announces its annual poetry contest, with a deadline of October 31, 2009. Persea Books announces the 2010 Lexi Rudnitsky First Book Prize in Poetry, open to American women writers who have yet to publish a full-length collection. The deadline is November 2, 2009. The Breakwater Review announces a call for submissions, with a deadline of November 15, 2009. Lumina is accepting submissions for its spring 2010 publication, with a deadline of November 15, 2009. The Tennessee Williams Festival announces its 2009 Tennessee Williams Fiction and One-Act Play Contests, with deadlines of November 16, 2009 for each. Alimentum announces its annual poetry contest, and will be accepting entries from September 1 through December 1, 2009. The Massachusetts Cultural Council announces awards for fiction, creative nonfiction and poetry, with online applications available December 1, 2009–January 25, 2010. SCWBI announces a works-in-progress grant for a contemporary young adult novel or nonfiction research, in addition to the Barbara Karlin Grant for picture book writer. Each has a submission period from February 15–March 15, 2010. Suss: Another Literary Journal is looking for submissions to its Learning Annex column, a pedagogy column written by contributing educators. For more information, go to: www.sussitout.org. Opium Magazine announces a call for submissions. Perigree is accepting submissions for its 27th issue, due out January 15, 2010. As an undergraduate institution consistently ranked among the most diverse in the country, Pine Manor College emphasizes an inclusive, community-building approach to liberal arts education. The Solstice MFA in Creative Writing reflects the College’s overall mission by creating a supportive, welcoming environment in which writers of all backgrounds are encouraged to take creative risks. We strive to instill in our students an appreciation for the value of community-building and community service, and see engagement with the literary arts not only as a means to personal fulfillment but also as an instrument for real cultural change. Click here to add your email copy and images. Unsubscribe jasensousa@jrockpublishing.com from this list. Forward this email to a friend. Copyright © 2009 Pine Manor College. All rights reserved. The Central Library is happy to welcome Jasen Sousa and Books of Hope for a joint reading. 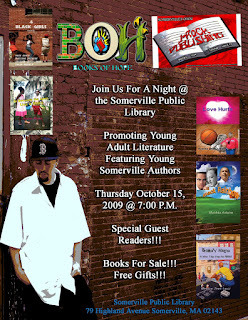 Somerville native Jasen Sousa is the author of six hip hop inspired poetry books that have sold thousands of copies and impacted the lives of young people all around the world. He is also the founder of J-Rock Publishing, a publishing house that specializes in producing books for young adult readers that are written by young adult authors. 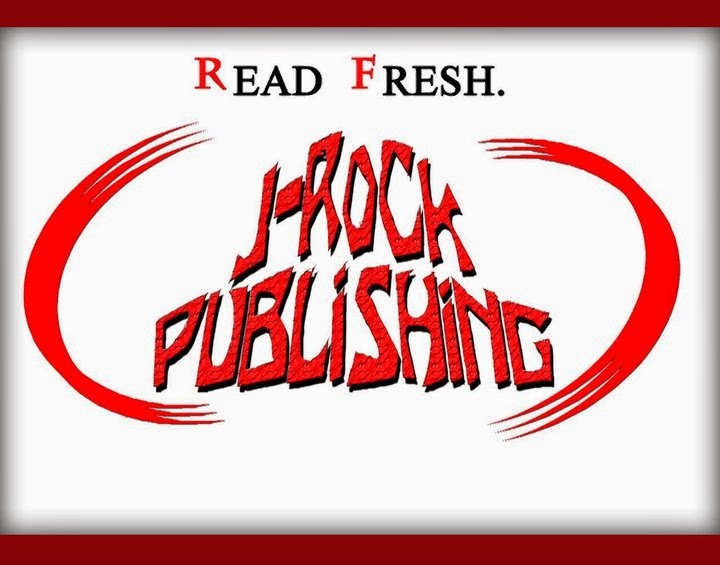 J-Rock was founded and created with the purpose to give young people a voice with the written word. Books of Hope is a Somerville writing and performance program for youth ages 13-23 that promotes expression and creativity through poetry, short story, memoir, dramatic, and non-fiction writing. Youths attend weekly workshops that focus on literary craft, public speaking, entrepreneurship, and community service. This intensive training combined with guest artists and field trips expands their awareness. Youth then write and design books that are shared with the public through reading events and are sold to benefit the young authors! This reading is free and all are welcome to attend - we hope to see you there! THIS WILL BE THE BIGGEST THING TO HIT THE UNDERGROUND IN YEARS! REVERE AT 318 SQUIRE RD. REVERE ON THE GROUND FLOOR. BE AVAILABLE TO PURCHASE IN PERSON AT THE ARTIST JUMP OFF. NEW DAY DAWNING IS A STORY BOOK ALBUM WHICH IS BASED ON A TRUE STORY. NARRARATED BY THE TALENT OF SPOKEN WORD POET "BEACON"
THIS IS A BACK BREAKER! EVERY BEAT AND SYLABLE CATCHES ANY EAR! Thursday October 15, 2009 @ 7:00 P.M.
inside of a premature tomb. That which will free her. That which will enslave her seed. because it feels the need to feed. on the bark of a rotting family tree. Hope this message finds all of you doing well. Thank you all for the continued support. Just wanted to give you the tour dates for all upcoming shows. I'm sure there is a show date that comes through you city or state (or with in close distance). M-Dot's 50 day tour begins on the West coast (Sept. 9 - Sept.23), then M-Dot will be performing with D-12 in Milwaukee (Sept. 24 - Sept. 27). We will back in Mass for only one week over the next two months (October 1rst), in which we will celebrate Rev's Birthday and DJ Six-S going away party live @ Kitty Osheas (Fanueil Hall, Boston). Then On October 7th Krumb Snatcha, Tableek & M-Dot will be on the road from October 7 - October 31. Finally on November 14th M-Dot will perform a coming home party/show with the Woodland Creatures @ The Sand Bar (Lynn, Mass), as well as a show in Manchester, NH (The Skaskeen, December 4th). Check all the dates below and see what shows you can make. Hope to hear from you guys. And I looking forward to seeing you. Be on the lookout for an M-Dot & Krumb Snatcha duo cd coming soon. And at some point next year you guys will at last get M-Dot's album "M.usically D.riven O.ver T.ime." September 01 M-DOT: A Boston MC With a Vision It’s the first day of September, so I’m going to start out by writing about an act I’ve been meaning to tout all summer. As some of you might know, I wrote about the Boston hip-hop scene for most of my 20 year tenure in Boston and while I still write about hip-hop for other publications in Boston, I’m nowhere near ground zero of the hip-hop scene as I was in the late ’90s and early part of this decade. Of course that’s what happens when you live on the other coast. But I’ve always been trying to ferret out new voices and talents, who just might finally help put Boston on the hip-hop map or somewhere near it. Sadly, the city’s scene has been ignored almost completely over the years. But one of the most vital MCs I’ve heard in a long time is M-DOT (it stands for Money Doesn’t Own Thought) and he’s a rigorous, versatile artist, who’s completely passionate about his music and expressing himself—the essence of what hip-hop should be about. It’s rare that you hear an MC with the kind of honesty, commitment and lyrical finesse that he possesses. M-DOT is Michael Januario, a 25-year-old from Lynn. He’s been rapping for nine years but you’d never know that he’s been honing his skills for less than a decade. His verse is lucid and tough edged but not phony playa nonsense. What really marks his work is his blue collar work ethic and sense that nothing is going to defeat him or stand as an impediment to not only changing his life, but also perhaps, alter the course of hip-hop. The latter may sound like an overly grand aim, but that’s the kind of spirit that makes his work so involving and vivid. His songs are about pushing himself to the limits. And, of course, like most good MCs, the music speaks on a universal level, so it resonates and has an honest, inspirational undercurrent that’s rarely found in hip-hop these days (The music is drowning in false inspiration and hypocritical, empty notions of faith and devotion). M-DOT’s work is indeed infused with a sense that this can indeed be a better world if we actually take the time to contribute something to it. He’s not about money, toting guns or strippers—the holy trinity of too many of today’s MCs. We all know that stuff is bogus, as are the claims to authenticity, and that’s why so many people are tuning out hip-hop. They simply can’t relate to it. M-DOT’s songs are about real life: work, struggling, relationships. And he flips rhymes with an insistent flow and dexterity. Earlier this year, he put out an outstanding mixtape filled with hot beats and even fiercer rhymes. He’s got his first full length CD coming soon and it should be interesting to see what he does over a concentrated work with specific producers. I’ve heard a few new tracks that I hope make the record because they are smart, involving and heartfelt. He seems to be wildly prolific, so who knows how much material he’s got stored up for it. The MC is also industrious and he says right now when he’s not writing, cutting tracks or playing shows, he’s serving as his own manager, booker and publicist, which is unheard of in the industry these days. He may be keeping Red Bull in business for all I know. What I am sure of is that this is a talent to pay attention to and if you like hip-hop—and I’m not talking about the silly stuff that’s passing itself off as hip-hop these days—then check this guy out. His website is at Myspace. www.myspace.com/mdotems. No doubt you can find his mixtape and more there. cartoons play in the background. Weeks of dishes sit in the sink. wanting to play hide and go seek. plucking soggy roaches from the tub. and shoving them into drawers filled with old LifeStyles. “I can’t fit in there silly,” she yelled! The loser has to give a piggyback ride. who is not my own. gluing sheets to her chin. falls like it always does. only touched by my hands. Her mom stares back, but I never say much. hang the blind and shut it softly. listening to my favorite song as it skips. In 1965 my father left all he knew. to build a new life in America. became enamored by a tiny switch in the bedroom. where his father waited to introduce wonders of a new world. and familiar faces from his neighborhood. he first arrived in America.